Canada’s job market showed surprising resiliency last month in the face of a crisis in the oil sector, tempering worries about the economy’s health. Employment increased by 94,100 in November, led by mostly full-time jobs that were broadly-based across industries, Statistics Canada said Friday from Ottawa. That’s the largest one-month gain in records dating back to 1976. The jobless rate dropped to 5.6 per cent, also the lowest in the data, from 5.8 per cent in October. This strength was unexpected -- economists were only expecting a gain of 10,000 -- in an economy hit by major headwinds in recent weeks. Economists and policy makers have been warning turmoil in the oil sector, which is grappling with depressed prices, could undermine the economic outlook and the prospects for future interest-rate increases. CIBC Capital Markets Senior Economist Royce Mendes called the report "“mind-bogglingly strong” in a note to clients. 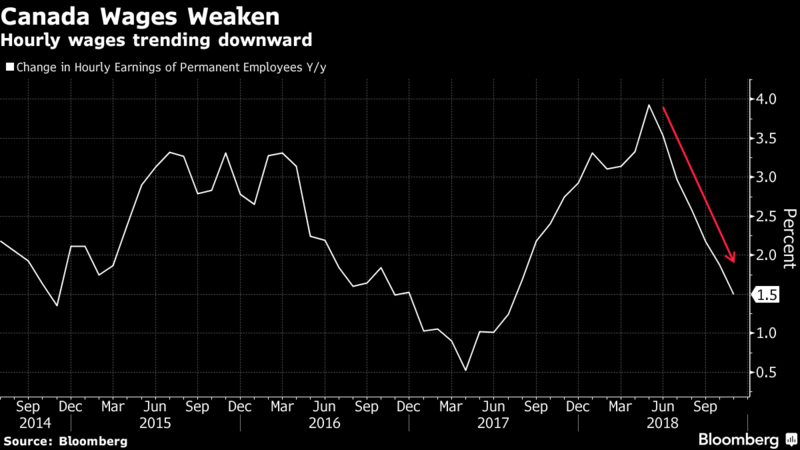 “The large gain in jobs will keep a January rate hike on the table for now, but we’ll need to see similarly positive evidence from other indicators and no major reversal in the next jobs report,” Mendes wrote. The Canadian dollar rallied on the report, gaining 0.5 per cent to $1.3316 per U.S. dollar at 8:37 a.m. in Toronto trading. It had dropped 1.4 per cent the previous three days. Yields on Canadian two-year notes rose 3 basis points to 2.02 per cent. If sustained, it would mark the first increase in nine days. Even the oil-producing hub of Alberta showed strength, adding 23,700 jobs on the month and pushing down the unemployment rate to 6.3 per cent, near its lowest since 2015. In percentage terms, employment rose 0.5 per cent on the month, the biggest monthly gain since 2012. The national gain in employment also came with a strong increase in the labor supply, driven higher by rising population and increasing participation rates. The labor force grew by 77,200 last month, the biggest one-month gain since 2012. While this data series tends to be volatile, the overall state of Canada’s jobs market so far this year had been one of decent employment gains that are neither too hot nor too cold but with some concerning signs -- up until November -- appearing on the labor supply front. The one negative number in the report was wages, with annual gains slowing to 1.7 per cent in November. That’s the slowest since July 2017. Wage gains for permanent workers were 1.5 per cent, also the slowest in more than a year. Overall, the economy has added a total 154,000 jobs through November, all full-time. The November number bested the previous high reading of 94,000 in 2012.